Just got home...again we only played half a game.. I need one of you experts to explain to me how I can watch a team win 3 overtime games at home and then put on the pathetic performance they did tonight....some players showed up but not many. And Hoss is it, from your prior posting..we fans that went did not give up....but certainly could have based on the performance we saw tonight...and Hoss is it, I said K's in 7....sad! Sorry who, those players did not give up. They were one bounce away from fighting back and making it a one goal game with auburn left. Did they play their best? Heck no. Did they give up? Hell no!!! I'm proud of this season and this series. We are not going to win a cup every year. Heck, this series will probably be better than the Finals. Sometimes a very good team executes so well and so consistently that it makes the opposing team look bad. Fact is, Toledo is very fast, doesn't make many mistakes, and when they do Lerg can close the hole most of the time. Our mistake was playing their game. Liked the Huntington Center. Fans were nice and the building was loud. I wouldn't trade Larry or Icy for their announcer and mascot even if you paid me money. This was a fun season with some very good hockey. Amazing how far this team has come since joining the ECHL. I also appreciate the fine coverage our two newspapers provide (how many cities have two newspapers anymore? ), Blake's tireless efforts and all the Fans. All I can think of is to paraphrase Chiefs'broadcaster Jin Carr. "the Komets'performance has got to be a bitter disappointment to these 800 odd Komets fans who have packed thia arena, paying good money to witness this...this fiasco ! Until I can let a day or two pass, I think I'd be better not to comment too much on the game. Sometimes we let emotion direct our thoughts. I can be honest to myself and say that while I'm very disappointed, I'm not surprised. Toledo took it to the K's from the start and didn't let up. On the day after, I can honestly say that this was a "fun" year. That the home record was astounding and there were plenty of good things that happened. Even so, I would suggest that we will be better able to gauge the success of the Komet season as we see where Toledo ends up. Maybe they're the best team in the league. They seem to be a complete team. 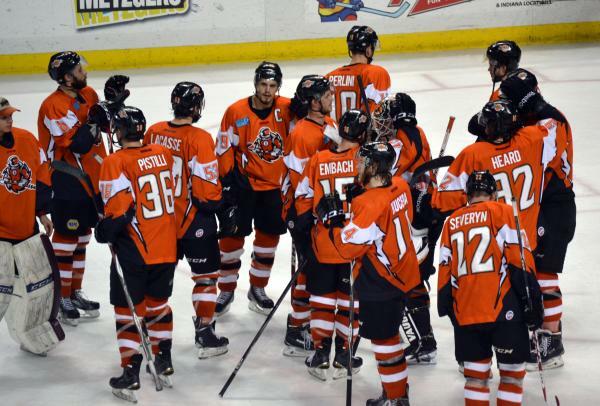 Speed, skill with the puck, great passing and special teams, goaltending, and defense (take a look at how their forward lines basically stopped the Komets top lines). South Carolina may have been the best team in the league the last 30 games or so. The matchup of Jakaitis and Lerg would be worth the price of admission. Anne- I second your thoughts. Especially your point on the media in this town. Wow, NHL coverage for a minor league price. We are indeed blessed with Chaser, Blake, Kent etc. Great ride this season. Not going to armchair anything. Hope a lot of them come back. As we all know, talent was not a problem with this year's team. The players seemed to like each other and get along. They had the ability to score goals. What was missing from the team were the winning qualities shown by Toledo, consistency and urgency of play. With lesser teams the Komets could usually turn things around and win, but with Toledo they could not. Besides the normal player recruiting issues for next year, a major concern has to be how to get the team to play 60 minutes of complete hockey. If the Komets had done that this year, their golf season wouldn't be starting so soon. Too bad, for both them and us.